For a cat in Vietnam, nine lives is not enough. 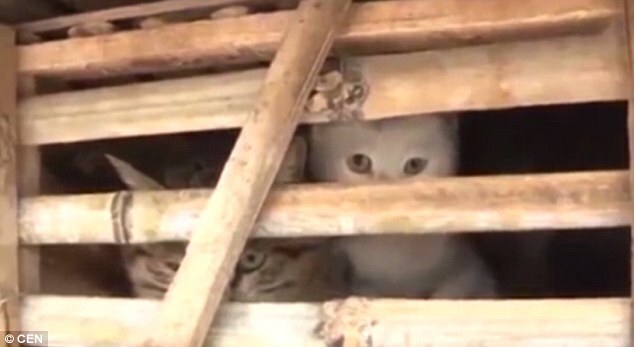 Last Tuesday, thousands of felines—said to be three tons in total—which were smuggled from China and destined for Vietnam’s illegal cat meat trade were destroyed by authorities after they intercepted a truck containing bamboo crates crammed with the animals. Photos of the cats locked inside the cages prompted an outpouring of support from various animal rights groups who offered to adopt or find homes for them. French actress Briggite Bardot even called the US embassy and told officials she was willing to provide financial assistance. To their horror, however, the Good Samaritans later found out that authorities had already dealt with the animals shortly after apprehending the truck. Earlier news indicated the authorities buried the cats alive. However, further investigation by various animal rights groups revealed that they first used a dump truck to crush the cats to d***h before burying them. According to animal welfare group Asia Canine Protection Alliance, the officials said they had to cull and bury the cats because they might spread disease. Some of the cats were already d**d when the truck carrying them was intercepted, they said. To prevent this, they hired a waste company who covered the crushed cats with lime and buried them in a waste treatment area in Hanoi, Vietnam’s capital. They defended themselves from accusations of animal cruelty, saying they were just following the law regarding animals that do not have health check certificates. They also brushed off allegations that some of the animals were still alive when they were buried, saying the (waste treatment) company made sure all the cats were d**d before burying them. Although illegal, the cat meat trade is flourishing in the country particularly after authorities also clamped down on another illicit trade—selling dog meat.